For those large and busy catering events, our Banquet Roll in White is a quick and efficient alternative to fussy table dressings. Provided in a roll for both easy storage and simple use, the 38 GSM paper is supplied in a 1200mm width and easy spreads across most traditional banqueting tables to offer protection through out your event. The paper has been finished with a heavy damsak steam embossed design giving it an aura of both luxury and professionalism while the cling-wrapped covering ensures all edges are flat and smooth during every use. 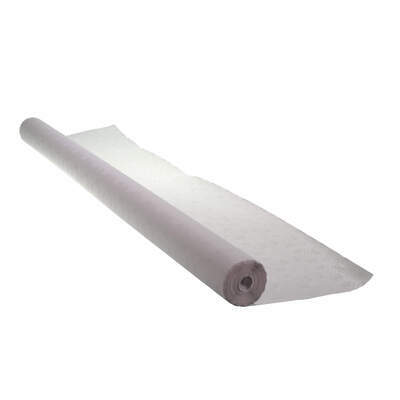 Supplied in a long 25-meter roll, this banquet roll can also be used to encourage children into group play during your arts and crafts sessions or simply spread across your buffet table to give added peace of mind. Make sure you have everything on hand for your next catering event with everything from Napkins and Table Covers to Cutlery from our Tableware & Napkins collection.